I wake in the early morning hours. Through the mosquito netting I see stars beyond a thin veil of clouds. I wake again, the night sky is clear and the milky way glows brightly. I wake a third time. I see only fog. I wake up at 7 a.m., a late sleeper that day, and the fog is still there. So is a nice breeze out of the east. 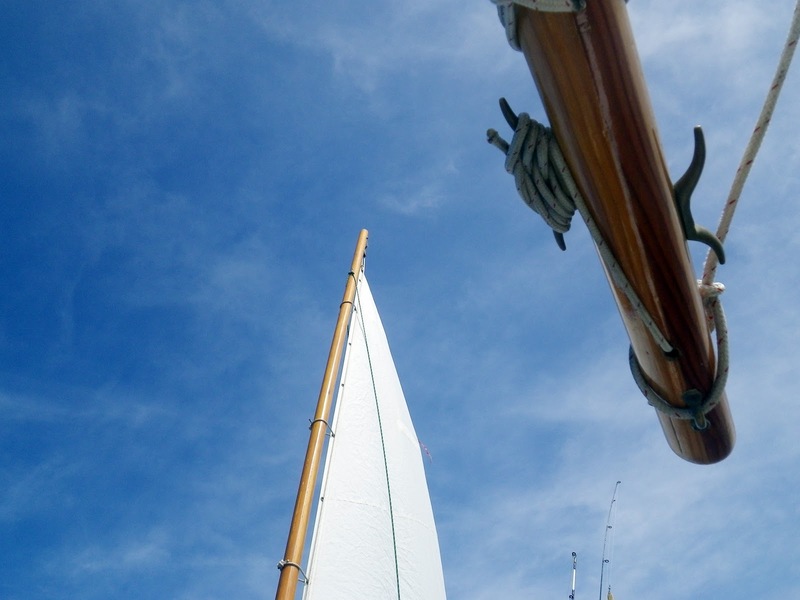 It takes twenty minutes to stow the sleeping gear, raise sail and haul in the anchor. 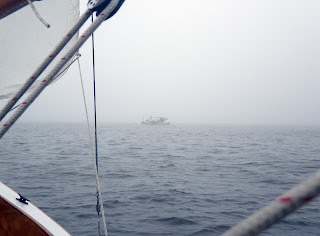 We sail at 4 knots to the south, heading into nothing but the white fog. I hear deadrise boats rumbling about so I reach into the day storage box and pull out the air horn. The fog thickens. I try to keep heading due south using the compass but find I do a better job by watching Spartina's track on the gps. The white-painted workboats boats appear and disappear along the edge of the fog. They are working trotlines, lines stretch out over the bottom for a few hundred yards baited with chunks of eel to catch crabs. The waterman works from a wheel mid-ship, running the trotline up over a device that raises the line from the bottom and drops the crabs into a basket. 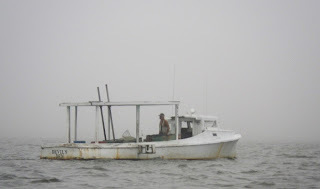 A deadrise by the name of Devil's Den, rough looking with rust stains running down her gunwales, crosses my bow. I wave, the waterman glances in my direction then looks away. Soon I hear gospel hymns coming out of the mist. A waterman on the Sandra Lynn out of Cambridge waves, stereo speakers blasting with songs of praise. I reach Fishing Point a little after 8 a.m. The winds falls off and I am surrounded by the thick fog, Spartina moves along at just a knot or two. A little after 9 a.m. there is no wind at all, I start the outboard. We motor along at idle speed, heading south until I see the shadows of Roasting Ear Point ahead. I bear to port to round the point. I see the stakes of fish traps in the shallow ahead and move more to the east. A little after 11 a.m. I am off of Crocheron. The fog seems thicker. Heading south past the fishing village I see patches of blue sky overhead. I pick out Straddling Point to the east as the fog begins to clear. I turn west towards the point with the idea of anchoring for lunch. But the wind fills in and the fog lifts. I find no reason to stop when we have a nice breeze. 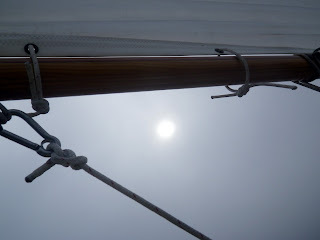 I shut down the outboard, turn south towards Hooper Strait and enjoy the feel of being under sail. Sailing out in the strait at over 4 knots I look up for the first time in three days to see blue skies. It is about time. The wind is crisp, the sun is warm. I debate my course for a while. I could head south on Tangier Sound, head west to Chesapeake Bay, or sail northwest to Rippons Harbor. 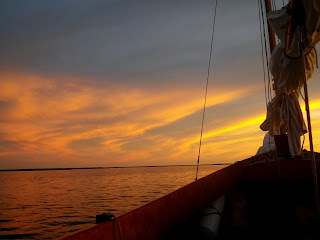 I finally deciding to head south on Tangier Sound towards South Marsh Island. Just as I make my decision the drag on the trolling rod goes off. This fish puts up a good fight. I get him close to the boat and he swims under the stern. I work him out and around the rudder and bring him alongside. 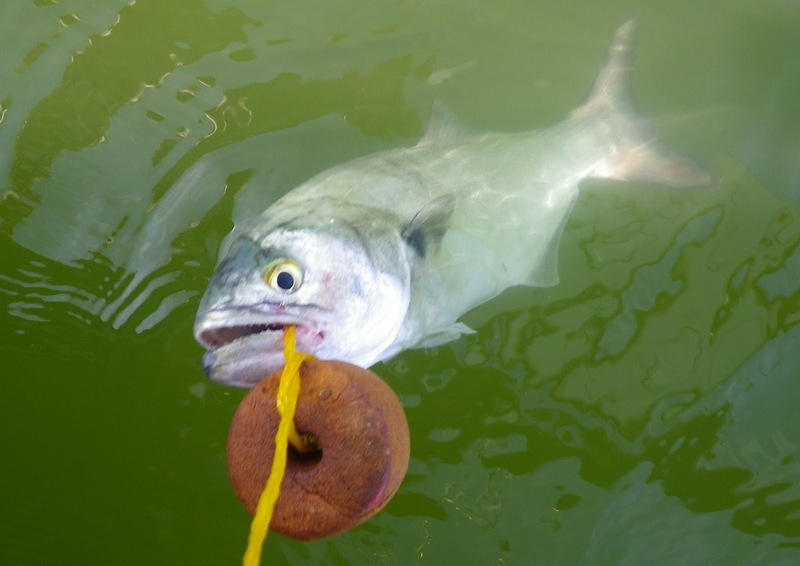 Soon the bluefish is flapping around inside the boat. Soon he is on the stringer trailing off the stern. The wind soon falls off and I'm under power again as we work our way down the east side of Bloodsworth Island. 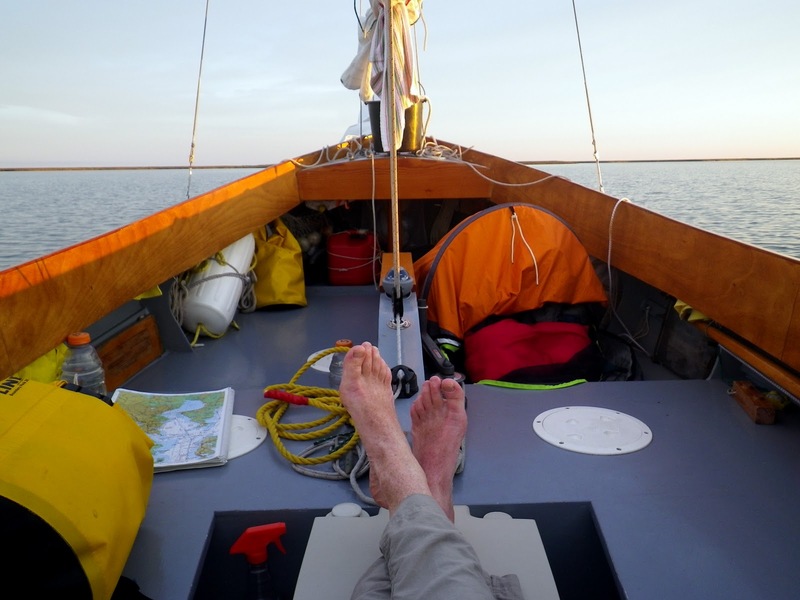 We sail past the shallows marked by crab floats and turn SW at Holland Straits. The wind fills in once again, carrying me through the straits and into a nice cove behind Gunbarrel Point on South Marsh Island. I anchor, grill the bluefish for dinner and relax in the evening. A jon boat with two fisherman from Deal Island approaches Spartina. 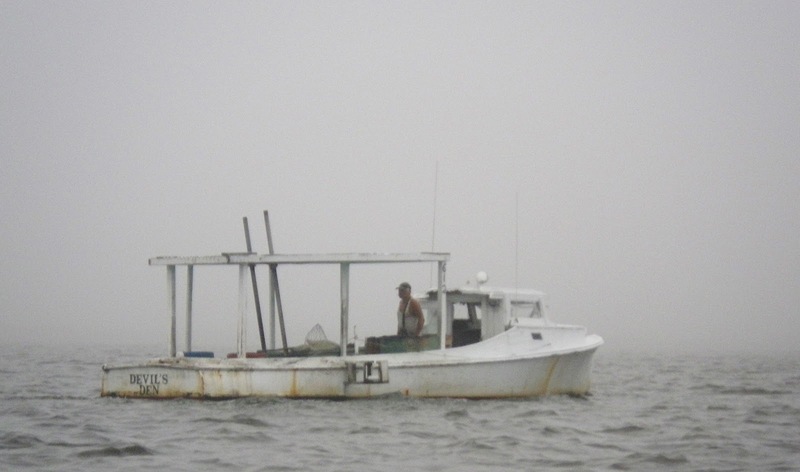 The older gentleman on board thought I might have found myself stuck in the shallows. No, I tell them, I anchored for the evening and I'm doing just fine. "Is your boat glass or wood" the man asks. "Wood" I tell him. "She's dory built, I can see that" he says. They offer to give me a rockfish for dinner. I tell them thanks but I just finished grilling a bluefish. I thank them for the offer, thank them for stopping to check on me. 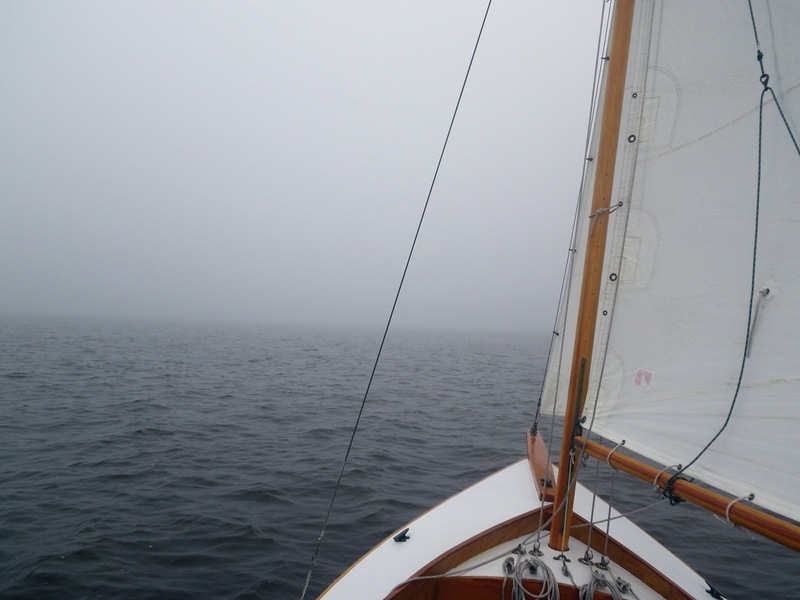 I found sailing in the fog interesting. I found sailing under blue skies enjoyable. I check the forecast for the next day. Showers and thunderstorms, SW winds to 10 knots.